The 21 Bitcoin Computer is produced by 21 Inc, one of the most prominent Bitcoin startups funded by the famous venture capital firm Andreessen Horowitz. It is also known as the first Bitcoin computer in the world. Given the reputation of its manufacturer and the anticipation and excitement of the Bitcoin community, I decided that it was worthwhile to buy this Bitcoin device and learn more about it. I wrote about this purchase in a blog post in the past. Only 2 days after the post, Amazon delivered the package to my address. 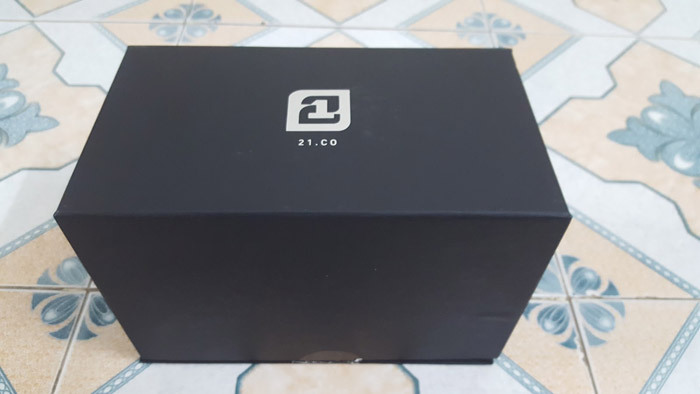 The 21 Bitcoin Computer arrived in a very nice black box with a 21.co logo on it. The following items are what you should expect to see inside the box. 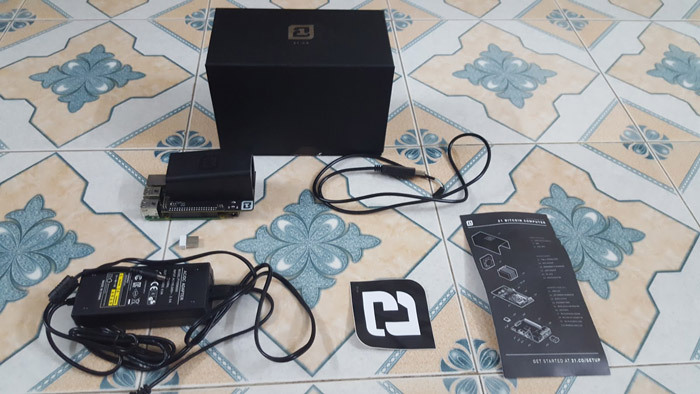 These include the computer itself, a Wi-Fi adapter, a power cable, another cable to connect the 21 Bitcoin Computer to your laptop, a 21 logo sticker, and a black sheet explaining the components of the 21 Bitcoin Computer. Reading the black sheet, it’s very easy to see that the 21 Bitcoin Computer is basically just an ASIC miner along with a thermal regulation system placed on top of a Raspberry Pi. Although there aren’t many creative and interesting things going on in terms of the computer’s hardware design, I really appreciate the look and feel of it. The big ventilation baffle and fan on the top certainly make the computer look more elegant than a regular Raspberry Pi. The first step to set up a 21 Bitcoin Computer is to follow the instructions on the black sheet and visit the Setup Page. The 21.co website has instructions for connecting the 21 Bitcoin Computer to a Windows, Mac or Linux laptop and even configuring it as a standalone Linux box. However, although the guide said that the entire setup process would take only 10-15 minutes, my personal experience proved that this statement was totally wrong. In fact, I had so much trouble following the instructions that it took me about 3 days and a lot of compromises to finally get my computer up and running. The first trouble was that even though 21.co provides you with a script for automatic setup which can be invoked by the following commands, the script doesn’t work in all environments. I used the 32-bit version of Ubuntu 14.04, and when I tried to run the Python script, my terminal froze. I reached out to 21.co Support, and they said that the Python script worked only in certain systems. That’s the reason why they had the instructions for both automatic and manual installation. This is a bad thing for novice programmers like me because manual installation means more work and more potential problems. The second problem I had was trying to access the device via SSH instead of cable. Because I was using my school's Wi-Fi, which makes use of DHCP protocol, every time I restarted the Bitcoin computer, it would be assigned a new IP address. Because there is no way to know the IP address of the Bitcoin computer without accessing it, I had to use the cable to first get the IP address and then SSH in before unplugging the cable later. 21.co Support suggested that I let the computer run constantly so that the IP address wouldn’t change. However, this might not be an option for many people because of the loud noise made by the embedded miner. There are dozens of other small problems with the 21 Bitcoin Computer, such as the fact that sometimes the terminal froze when I booted it up or the HDMI to VGA cable did not work when I wanted to connect it to a monitor. Because the 21 Bitcoin Computer is relatively new, it might be difficult to find solutions on the Internet to specific problems. However, the Support team is very accessible and helpful. They provided me with guidance at every step throughout the 3 days when I was setting it up. What Can You Do with the 21 Bitcoin Computer? Second, 21 Inc has created a marketplace for you to monetize your applications by selling your API calls for a small amount of bitcoin. This is enabled by the innovative micropayment channel invented by 21 Inc. It’s also part of a pretty ambitious plan by 21 Inc to build a frictionless and efficient machine-payable web. You can watch this YouTube video for a clearer picture of 21 Inc’s vision for the 21 marketplace. The 21.co website has a lot of tutorials that teach you how to build and sell simple applications using the 21 Bitcoin Computer here. There are many cool tutorials ranging from building a simple Bitcoin game to building an app to translate from English to Chinese for bitcoin. Of course, those are only very simple examples; cooler applications could also be built on this computer, such as these. Is the 21 Bitcoin Computer Overpriced? The 21 Bitcoin Computer is selling on Amazon for $399 . As mentioned earlier, it is merely an ASIC chip placed on top of a Raspberry Pi 2.0. Based on my experience, the mining power of the ASIC chip ranges only from 50 GH/s to 75 GH/s. Considering that it makes only a few thousand satoshi per day, and the Raspberry Pi 3 is only $36.79 on Amazon, the 21 Bitcoin Computer is clearly overpriced. This price level shows that most of the value of the 21 Bitcoin Computer is in the software package and the access to the 21 marketplace. However, if you are a techie, you can always follow the DIY tutorial on the 21.co website and set up all of those things by yourself with a Raspberry Pi 3 . The total equipment expense is only about $70.46. All in all, I believe that the 21 Bitcoin Computer is a great device for any blockchain developer. The 21 library provides great tools to build Bitcoin applications quickly and conveniently, and the 21 marketplace gives us chances to make money by letting other people call our applications and receiving a micropayment for each call. The embedded ASIC miner also creates a tiny stream of bitcoin, enough for the process of building and publishing your applications. 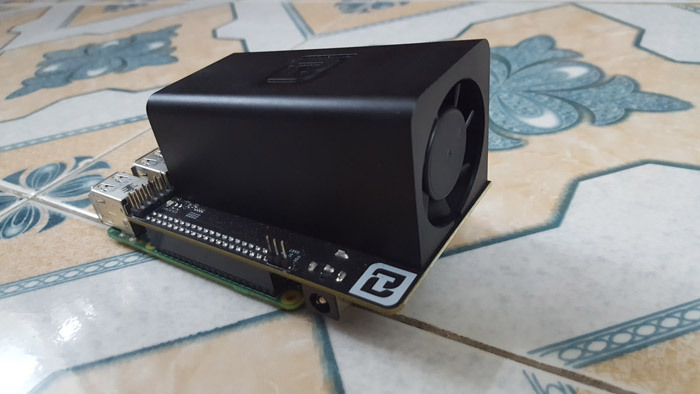 If you have a thorough technical background but not too deep a pocket, it might be better to build your own Bitcoin computer with a Raspberry Pi rather than pay $399. Otherwise, the 21 Bitcoin Computer is a must-have device for any serious programmers and innovators who want to build the next Bitcoin killer app.